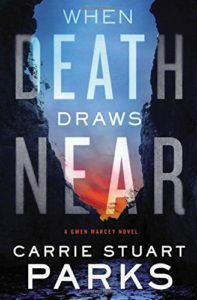 When Death Draws Near by Carrie Stuart Parks is a contemporary Christian thriller. It is the third book in the Gwen Marcey series but can be read as a stand-alone. I had not read the previous novels. When Death Draws Near’s style is reminiscent of the 1950’s film noir and I loved it. The novel is written in the first person from the point of view of Gwen. As the novel progressed, in my head, it felt like the voice over in the old black and white Philip Marlowe films. I found it a very clever and effective technique employed by Carrie Stuart Parks. I must admit at times I found the number of different characters confusing, maybe this is because I had not read the earlier novels. However I soon got completely caught up in the action and found my heart racing as I sped to the conclusion of the novel. Gwen has fought cancer. So far she is a survivor but a survivor who has no time for God and little faith in prayer. Gwen sees prayer as pointless. She believes that God already knows what will happen so why pray? “God knew the outcome. How could anything I prayed for make a difference?” Gwen has missed the whole point of prayer. Prayer is a two way conversation with God. It is to build a relationship and trust in Him. It seems like a miracle will be needed for Gwen to pray again. Gwen is a good mother. She has a fierce instinct to protect her daughter. You do not want to cross her. This reminds the reader that God loves us and He too longs to protect us and help us through life. Gwen is a forensic artist. The remains of the dead speak to her. She translates this into an artist’s impression. This can be seen as a motif for our relationship with God. We do not necessarily need to use words but God sees just what we are like. It also ties in with the theme of identity. “My identity had been Robert’s wife.” Our identity should never be wrapped up in another person. Our identity should be found in Jesus. There is the need for closure on present and outstanding crimes. Gwen will push on trying to uncover the truth. The novel explores the silence of God. “Talk to me God! Answer me!” Sometimes we cannot hear God but that does not mean that He is inactive. God is always caring for us and working for our good. The novel examines the theme of trust. Sometimes life is very confusing and we do not know who to trust. Gwen is told to “Trust no-one.” But there is One whom she can trust and He is God. Within the novel there is a religious group. It is viewed with suspicion and mistrust. Are the people good or deluded? You must read the novel and make up your own mind. I very much enjoyed my first delve into the world of Gwen Marcey. I shall certainly be exploring more novels with her as the central character.